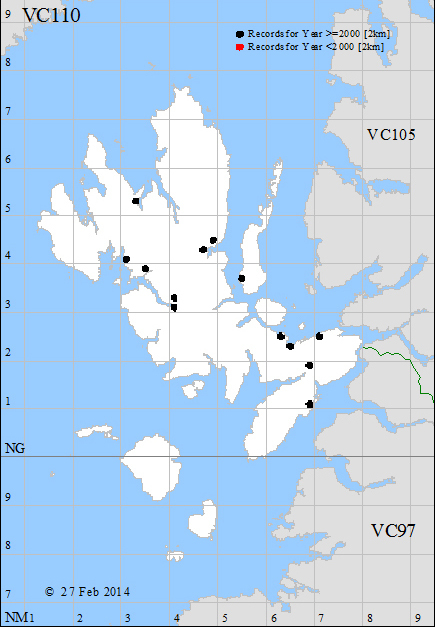 From Sandy Masson I learned that the Peltaria alliacea (Garlic Cress) at the top of the shore at Rubha Phòile was planted by an itinerant Irishman in, I think, 1988, and that it seeds up onto the area above. 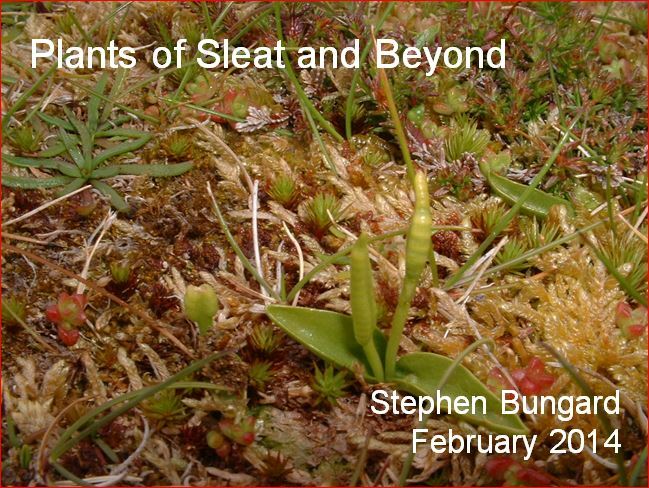 Roger was inspired to send me further Aspen and Early-purple Orchid records today – but we still have no EPO record for Sleat since before the year 2000. There seemed to be some enthusiasm to look out for plants not recorded recently in Sleat. I am, of course, always delighted to receive records or queries – or images for identification…..
Watch out – this pest may be heading your way….. Meanwhile Steve reports Cotoneaster simonsii (Himalayan Cotoneaster) from NG52, the first record for that 10km square for forty years. By myself Wednesday 26th February Ardvasar Village Hall 19:30. 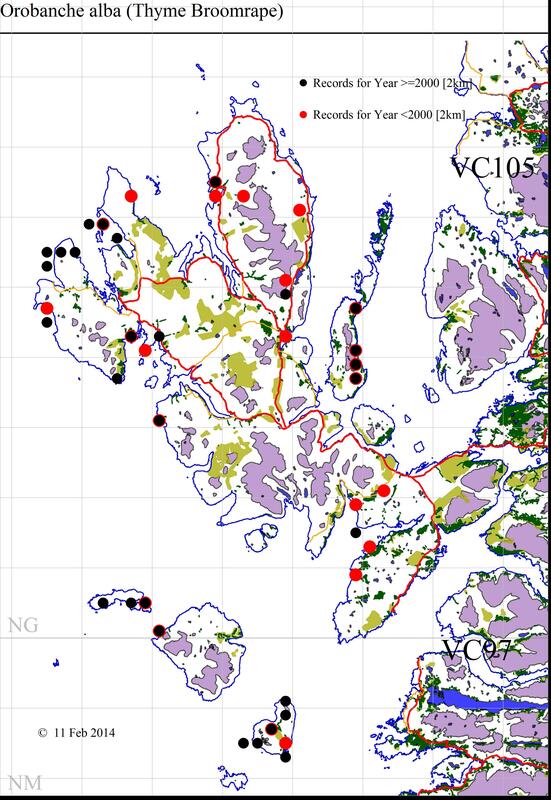 Jim Bevan has sent me his database containing over 10,000 records, nearly all from the Small Isles and before the year 2000. Nearly 6000 of these are records he was involved with during the 1990s, either alone or more commonly with others. 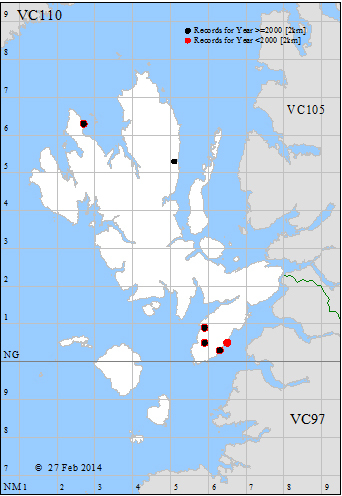 What makes them so valuable is that they are mostly at tetrad or better resolution – making a huge difference to the appearance of the history of recording in the Small Isles as shown below for Potentilla erecta (Tormentil). 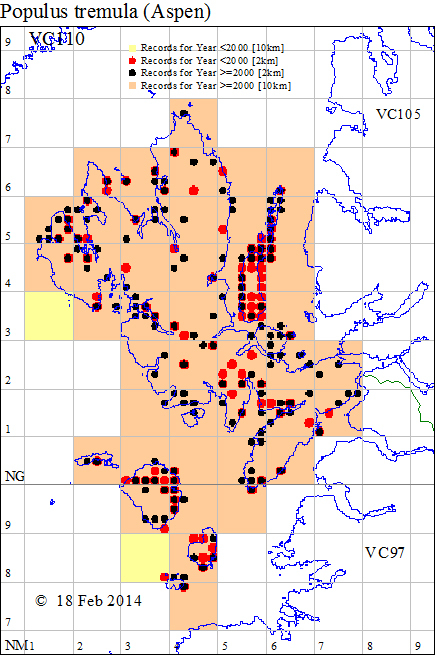 When I combine the two sets of data there will be a lot of red dots behind the black ones. Many of the remaining records in the database are from other published or unpublished sources and in many cases I already have them in some form. However, I am importing nearly all of them as in many cases there is more detail than I previously possessed. 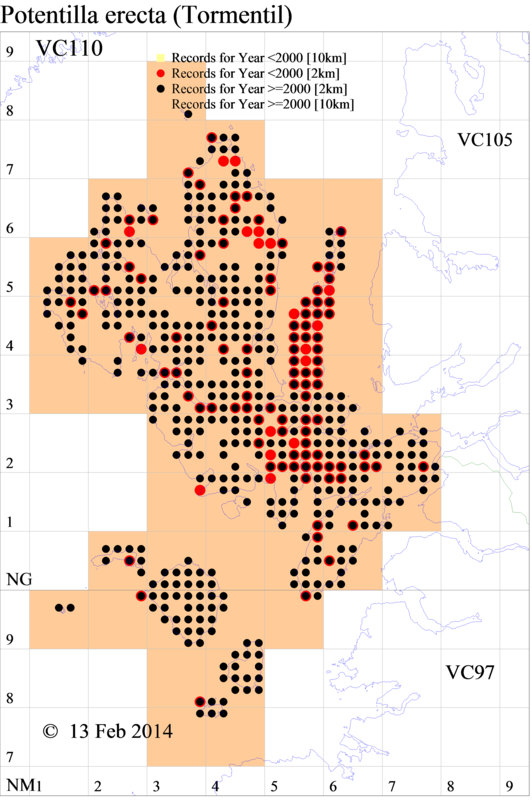 For example, a number of records I received from the BSBI Distributional Database for Hyskeir were anonymous and with a wide date range of 1987 to 1999. I now know them to have been made by D. Miller on 7/6/1992 and 30/4/1993. 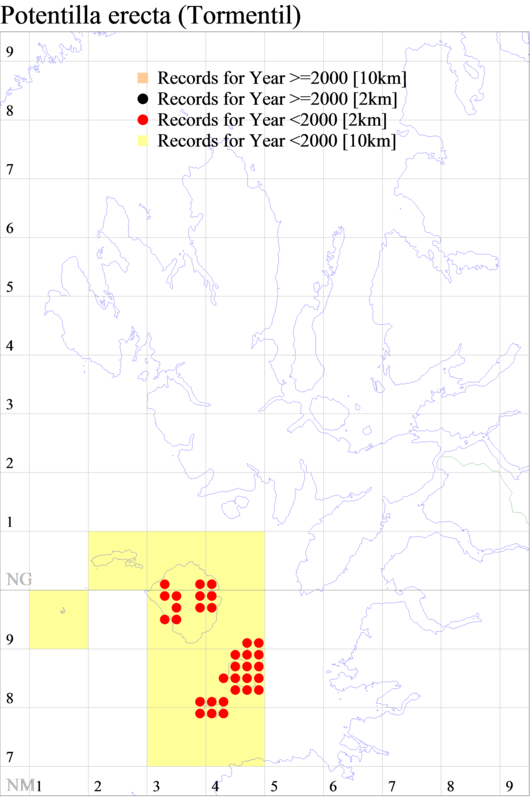 Jim’s database contains records for 136 taxa that are included in the Rare Plants Register. 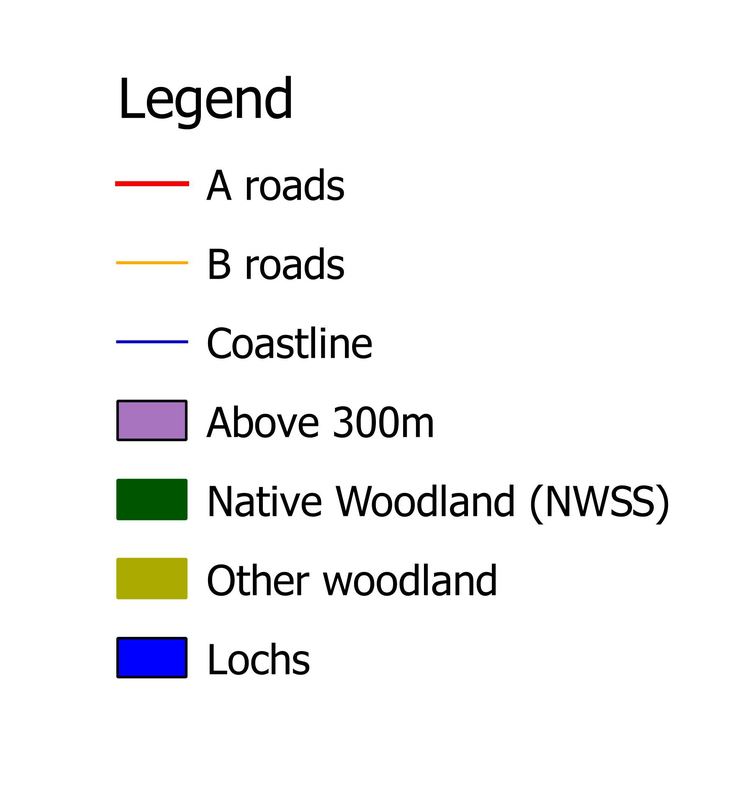 In general these records are not going to significantly affect the distribution of plants recorded in the RPR, but it is now going to be much bigger task to update it than I had been planning. This may wait for next winter now. 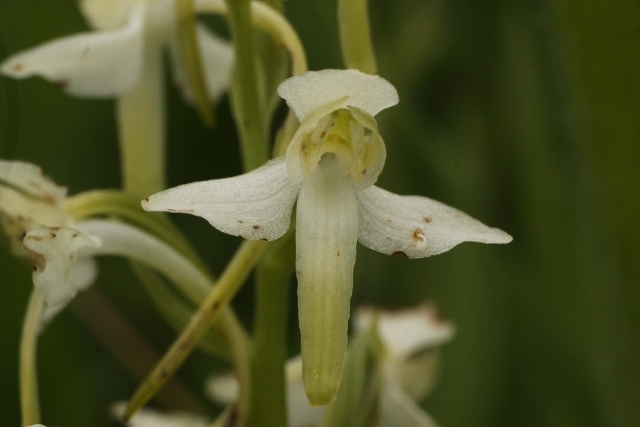 I think this works rather well…..
a) Lesser Butterfly-orchids (Platanthera bifolia) flower 7 – 9 days earlier than Greater Butterfly-orchids (P. chlorantha). 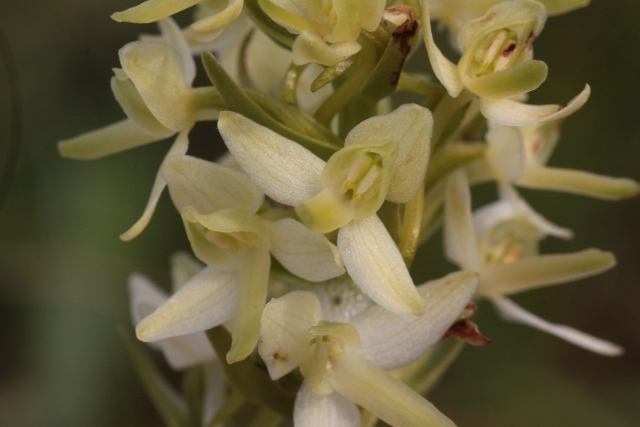 So overall, Greater Butterfly-orchids are more robust than Lesser Butterfly-orchids, a finding that is not always recognised in the literature, though is perhaps implicit in the vernacular names. It remains a mystery as to whether they different species or as the molecular evidence purports, an example of morphological polymorphism. Excellent stuff and the work continues. He also gets some fine hybrid orchids. Much of the above is taken directly from Terrys’s notes – many thanks for sharing!